The traditional german home-made noodles have been re-created by some american celebrity chefs and featured several times on HGTV's Iron Chef America. They are easy to make but you'll need a Spätzle maker to make these round shaped noodles or a Spätzle press for longer shaped noodles. Sieve flour, add the salt, add one egg at a time and water little by little while stirring with a hand mixer. Mix for ca. 1 minute until batter is smooth and air bubbles start to form. Add finely chopped parsley to the batter if desired for a fresh taste. Let batter stand covered with a dish towel for 20 minutes in a warm place. Meanwhile bring water to a rolling boil in a large pot. Season with salt. Pour batter into your Spätzle maker. Move top part of the Spätzle maker back and forward until all batter is used for that batch. Using a slotted spoon stir the Spätzle in the boiling water until they rise to the top. Fetch Spätzle with slotted spoon and transfer to a large colander to drain. 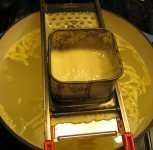 Pour the next batch of batter into your Spätzle maker making one batch at a time. Make sure water boils, if it stops boiling you can cover the pot with a lid between batches until water returns to boil. 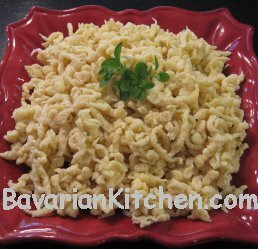 You can make Spätzle ahead of time or up to a day before serving them. Just before serving sauté the finished Spätzle with a tablespoon of melted butter in a skillet until warmed up. tip: leftover Spätzle are great for Käsespätzle (cheese Spätzle).